This gazebo makes good use of a waterside location. Gazebo kits cost around $5,000-7,000, and can be customized or painted for a more finished appearance. 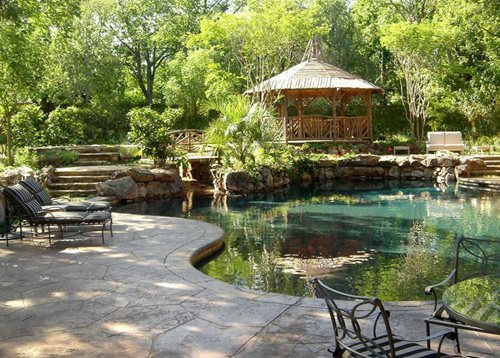 Your landscaper can advise you on how to integrate it into the surroundings to make the most of its classic look. 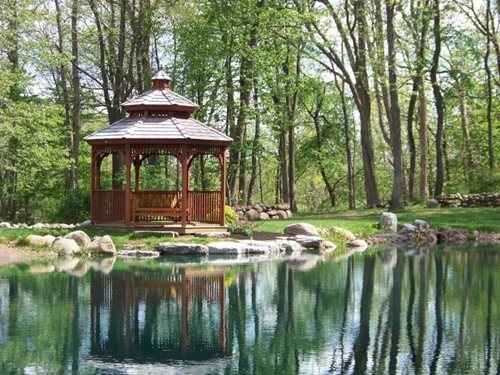 A custom gazebo may cost double that of a kit or more, depending on size, materials, and other factors. A gazebo is an eight-sided shade structure with a solid eight-sided roof. It usually has a built-in bench running along the inside, and sides that are open to the air so you can enjoy the surrounding garden views. The first point to remember is that your gazebo is meant to be used, so it should be easy to get to with a clearly-defined, comfortable path. If you would like to enjoy the sunset or an evening glass of wine in the gazebo, then landscape lighting along the pathway is a good idea. A life of leisure is not in the cards for most of us, so a great deal of your enjoyment may come from looking at the gazebo from inside the house. “Even when you’re not using it, you can have an appreciation for how it makes you feel to look out at it,” says Alison Terry, a landscape architect in Fullerton, CA. Think about how it will appear from each of your windows, and consider placing a small tree nearby to soften the appearance and make it look like an integral part of the landscaping. The view from the gazebo itself will play a part in how likely you are to make time to enjoy it. Even in a small space, you can design vignettes nearby that are a pleasure to look at, such as a statue or fountain nestled among the shrubs. While it can seem like a good idea to place your gazebo near the property line so it’s thoroughly within the landscaping, make sure the sounds of neighbors or nearby traffic won’t intrude on your enjoyment. If you need to distract from less-than-ideal sounds, a small fountain or water feature nearby creates a more pleasant ambience. A tropical style gazebo was built in the distance behind this pool. Style-wise, a gazebo’s not the best fit with the average urban or suburban home. 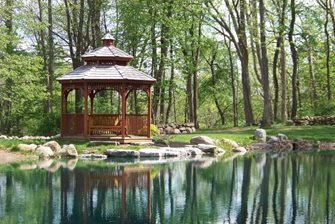 Most people don’t establish such a strong classic theme in their landscape, and placing a gazebo in the average backyard looks out of place with both the landscaping and the architecture. “If you have a modern house, we’d design a sunroom or a patio cover instead,” says Terry. Gazebos have fallen out of favor in recent years. This is partly due to the fact that they don’t mesh well with modern styles of architecture, and also that few people are designing formal, highly-themed English or French style gardens. Gazebos have also gotten a bad rap because so many people use cheap-looking kits to build them, and don’t pay attention to placing them appropriately within the landscape. A dusty, unused gazebo in the middle of a suburban lawn does nothing to encourage others to explore the style. That said, a gazebo can be an elegant, refined choice in the right setting, given it’s built well and incorporated into the landscape in a seamless way.